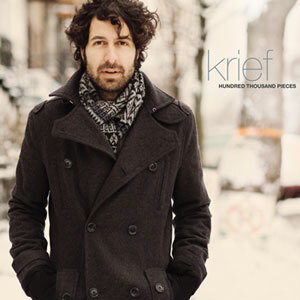 Hundred Thousand Pieces is the third solo album by Patrick Krief, guitarist for The Dears. It shouldn't come as any great surprise then, that the album is populated with authoritative guitar work, but the intense dreaminess of the songs, underlaid with deeply textured instrumentation, was far more powerful and affecting than I expected. This is a lovely album, filled with soulful choruses, soaring vocals and intimate lyrics. The vocals balance beautifully with the dense and well-conceived instrumentation, especially with well-placed flourishes of crying guitars. At times ethereal, at times meaty and driven, Hundred Thousand Pieces features tracks that feel at once strangely familiar and completely fresh. I found myself singing along with the chorus several times on first listen. Definitely worth a listen, or ten. Do you want a copy of Krief's Hundred Thousand Pieces for your very own? I just happen to have one CD copy to give away, courtesy of our buds at With A Bullet. you would like to see release a solo album. The winner will be chosen by random draw (flexing up the drawing fingers as we speak). Contest closes midnight July 10, and is open to Canadian residents only (sorry). Enter now! Trust me, you don't want to miss this one! Nice one, Jen! You are officially entered. Would that ever be lovely to go to that concert at a winery, Kelly! Wear sunblock. Soooo .... do you want to enter the album giveaway contest while you are here? sunblock, good idea especially with my lack of hair on my head. Fair enough, Kelly. Do enjoy that concert, though! As much as a Neil Peart solo record would certainly have an appeal I would love to hear Win Butler do something by his lonesome. A drum solo album would have definite crowd appeal, Sean, but a Win Butler endeavour would be slightly more awesome. Great choice! You are officially entered.